Have delivery? Sometimes we know those drivers are carrying too much money! You can use the delivery driver drop system to record how much money each driver has left at the store. 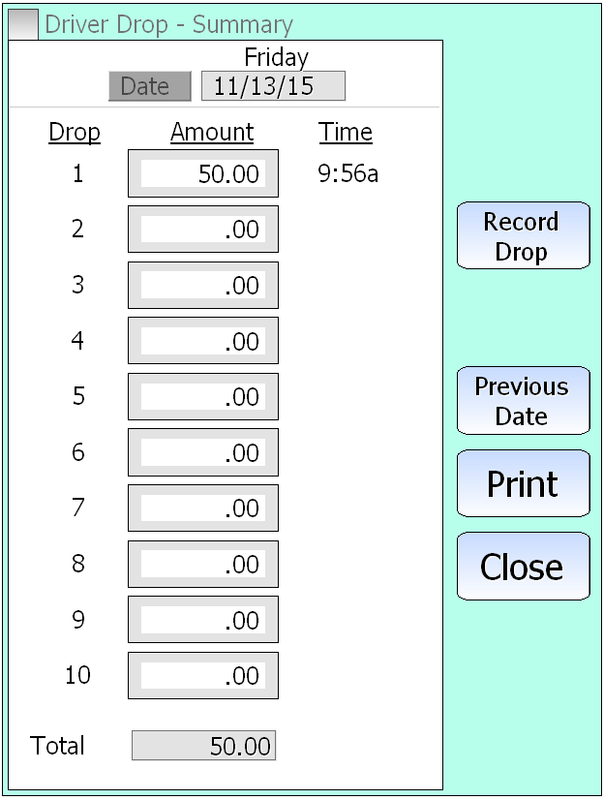 This allows you to print a receipt for the drive as well so there is a record of the drop after the employee leaves the money. Here is something that comes up every once in a while. . . If you have delivery drivers, then you might be paying more in insurance than you need to. Most insurance companies bill you based on total payroll hours for all employees working the store. Delivery drivers are billed at a higher dollar per hour than kitchen prep or cashiers. This is done because there is obviously more risk when an employee is on the road. The problem here is the you are also paying the higher rate for that employee when they are not on the road as well. For example . . . Let’s assume your insurance company bills you at $2 per $100 in payroll for prep, cashier etc and then $7 per $100 for delivery drivers. For this store, they did 7,000 deliveries and 2,830 hours on the road. That is an average of 24 minutes per run. Insurance should only be billed at the higher rate for that payroll that was on the road! By taking the total payroll for all delivery drivers and subtracting out the payroll amount for those 2,830 hours on the road, we can get a true figure of how much payroll should be billed at the higher rate. In this case, it was an $1,100 savings in insurance! If you have deliveries, see how we can help you with our XML ticket history report. Order types are an interesting concept in SP-1. Basically they give you the ability to assign a station to the type of order that will normally be accepted on that station. In this scenario, you have two stations for the front counter and two stations that are used to take phone orders. By using a default order type we can help speed that service. So, the phone stations would automatically be set to show the caller id or phone number screen and at the end of the order the type would be pre-set to “Pickup” or “Delivery” (depending on the type of business). The order type can be changed on the fly as well. For those of you that offer delivery service, you have had some big questions you had to address. It seems like such a simple situation when you open a store but delivery is actually a very complex affair. SelbySoft has some solutions for you however! Today we will talk about the different ways that stores charge customers for delivery. Most of our delivery customers choose to have a minimum delivery amount. With SP-1 this can be based on the ticket or a menu group. An example of the ticket amount would be that you may want a total ticket dollar amount of $10.00 in order to deliver. An example of the menu group would be to only deliver if they order $10 of pizza, regardless of how much they order otherwise. This stops the an employee from taking a salad delivery only. Once a minimum charge is setup, you can choose to allow the customer to pay the difference between the minimum and the ticket total in order to meet the requirement! For example, if a customer buys $8.00 of product, then SP-1 will add $2.00 to the ticket to meet the $10.00 minimum. You can also add an option for overriding the additional charge if needed. If the customer meets the minimum delivery requirements, then we get into what and how do we charge them? With SP-1 you have four main methods of doing this. . . Per ticket – With this you can add a charge per ticket for the delivery. For example -$2.00 per delivery. Per item – A little more complex. In this method, you are charging based on the menu item and / or the order type. So, if a customer orders 1 pizza for delivery, you may charge $1.00, 2 pizzas, $1.00, 3 or more would be $3.00 for the charge. This can be used for a variety of different charges as well. There is another method of doing this as well by using the accumulation switch. With that turned on, the per item charge is accumulated. Street Names: With this activated, you can set a delivery address based on the specific street a customer lives on. All of these options allow for delivery charges based on the time of day or day of the week as well! What about paying delivery drivers? In our last post, we talked about different offerings for those of you that deliver and how to charge a customer an additional fee for that delivery. So what about the driver? Most of the locations we work with compensate their drivers in one way or another. With SP-1 you can choose a number of different methods for accomplishing this. Per Item: With this selected, you can actually compensate your delivery drivers based on the number of items they deliver per ticket! Per Ticket: By far the most common delivery payments. The employee is compensated per run. Percentage: Compensate based on a percentage of the total ticket. This is a great option as you can then compensate different drivers with different amounts. You simply put a percentage that you will will compensate in the employee master file. Milage: Compensate for miles driven. Another great way to compensate because it is based on distance and can have a different amount per driver. You enter the milage in the employee master files. Once this is activated, you can then have SP-1 record the total in and out milage for the employee as well! None: If you use a company vehicle for deliveries you may not compensate beyond the normal wage. How accurate are your quote times? When a customer comes up and orders product do your employees quote a standard time or are they using an accurate number generated by your POS system? SP-1 has a great feature called Order Processing that allows you to accurately quote a time to your customer right when they order and also allows you to track your make time efficiency. With SP-1, you setup a station on the make or food line that shows every item being ordered. Once an item is made, it is removed from the monitor by the person on the make line. This allows you to see the total time it took from order entry to order completion. SP-1 will then provide an accurate quote time on each station that the crew member can provide to the customer. Another great benefit of this is that you can see how many orders were finished after the quote time! Our customers that use this system find that they have a more streamlined operation. So give us a call and see how we can help you take advantage of this. Recently, I had a conversation with a customer about his delivery drivers. He explained to me how his insurance company bills him based on the payroll hours of his employees. The insurance company bills insurance for employees at $2 per $100 in payroll for kitchen prep and servers and then $7 per $100 for delivery drivers. The issue that he had (last year and this year) is that the $7 figure on drivers is based on the clock in and out time. Realistically, the higher insurance rate should only be based on the time the drivers are actually on the road and not based on the rest of the time when they are working inside! So, the question was posed . . . How could we help? The most important figure was the 2830 hours on the road. This allowed the customer to show the insurance company that the rest of the payroll for these employees was in house and not on the road. This resulted in a savings of $5 for every $100 in driver payroll. The grand total in savings? So, if you deliver and are curious about what you might be able to save, call us! Multiple Delivery / Catering Addresses! Do you do delivery? How about Catering? If so, are you aware that you can track 10 phone numbers and four addresses total? This is a great option for those of you that do delivery or catering. For example, if someone orders and wants it delivered to a second address – You can enter that address and that will be the delivery/catering address instead of the main one. Also, by storing 10 phone numbers you can have the customers cell, home, office etc all under the same account. This works just as well for those of you that do catering. With factories and large companies you can use the multiple address field to make sure that the order goes to the right department!